Alexei Shevyakov, Director of the Social and Economic Population Studies Institute of the Russian Academy of Sciences, recently presented a report on income distribution and its adverse effects on national well-being. It revealed a previously unknown relationship between economic and social factors that are affected by the wealth gap. 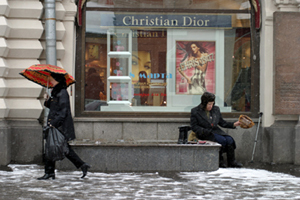 In Russia, the incomes of the rich are almost 20 times higher than the incomes of the poor. The Bolsheviks once promised to solve this problem by seizing all of the wealth and redistributing it equally among the general population. However, this ended up bringing more harm than good. A more modern approach has been to simply raise wages and pensions - this is a policy that the Russian government has been pursuing for the last eight years. Indeed, wages have continuously outpaced GDP growth throughout the decade and annual real wage increases have remained in the double digits, bringing tangible results for the general population. As a result, the absolute number of poor people (e.g., those living below the threshold of poverty) is dropping: from over 40% at the beginning of the decade to around 20% today. However, the problem with this statistic is that it is defined exclusively by bureaucrats themselves. One could potentially eliminate "poverty" altogether by manipulating the data. To address this problem, European countries tend to use a relative poverty indicator. This approach measures the distribution of wealth in society, rather than absolute poverty, by determining the "poor" to be persons with incomes less than 60 percent of the per capita national average. In Russia, under the monthly average of 6,500 rubles ($268), this method would classify almost half of the population as "poor." Paradoxically, this number has (and continues to) increase together with rising overall incomes and GDP. In fact, this is not unusual: the contrast between these two approaches to defining poverty is striking. When pensions and wages rise, the absolute number of poor people goes down. That makes sense. But relative poverty keeps growing, and it increases more in wealthy regions. Moscow is a good example of this: about 13 percent of its residents live in absolute poverty, but 57 percent would be considered "poor" according to the European method. Could this be a purely Russian phenomenon? I think it is. The mechanism of wealth distribution in Russia today differs drastically from that of developed countries. That explains the paradox of relative poverty rising along with economic growth. Our Institute ran a series of mathematical regressions to study the dependence between inequality and key social and economic indicators in Russia. We found that there is hardly any link between absolute poverty and these indicators, while relative poverty depends on them directly. In other words, you can go on raising pensions and wages, but as long as relative poverty continues to grow, no serious progress will be achieved in regards to the economy or the demographic situation. Simply raising wages and pensions is not the most effective way to combat the adverse effects of poverty. We discovered that income inequality is very important to this analysis. Until now, scientists have simply relied on the Gini index, which shows the difference between the incomes of rich and poor persons. Relating back to the Bolsheviks' dividing all capital evenly among the general population, we found that simply attempting to minimize inequality is ineffective (even if it is done by peaceful and legal means). Inequality comes in two forms: normal and excessive. The former propels the economy, stimulating people to fulfill their potential. It is a locomotive for development. But excessive inequality, on the contrary, is a brake that gives rise to a host of societal problems. So where is the boundary between "normal" and "excessive" inequality? Our data suggested that, for Russia, the optimum level would be if the wealthy had incomes 7-9 times those of the poor, and not 20 times, as it is today. Europe arrived at approximately the same conclusion by "groping in the dark," graduating towards that ratio over decades of trial and error. However, up until now, all arguments concerning the level of inequality had one flaw: they did not rely on exact science and statistics. In this sense, our study is unique: we have determined a level of inequality for Russia that would ensure intensive economic development and help to solve pressing demographic problems. In fact, some data shows that if Russia had been at this optimum level of inequality in the years since perestroika, the country would now have a GDP that is 30-35 percent higher than it is today. Similarly, we could have expected its population to increase to around 160 million by 2050. However, if the current excessive level of inequality persists, the country's population will shrink to approximately 124 million in the same time period. In the United States the inequality coefficient is 14. In Brazil, it's even higher than in Russia. Yet both of these countries have experienced high levels of economic growth. The explanation for this lies in the fact that our "optimum level" data only applies to Russia. It could very well be higher in the United States, or in a number of other nations. The U.S., for example, is at an entirely different level of development, and only a small proportion of the population lives in relative poverty. So, the country can afford a higher level of inequality. This owes much to the national features of America, its history and its people's tolerance of inequality and wealth. As for Brazil, like most Latin American countries, there has been a huge gap between the rich and the poor throughout its history. The population is ready to live with that for the time being. In Russia, people lived in roughly similar conditions for almost 80 years. The inequality coefficient for the U.S.S.R. was somewhere between two and four. People in this country always had a keen sense of justice and a conservative attitude toward wealth. And then, all of a sudden, society became drastically polarized: some lost everything, while others saw fortunes fall on their laps. Most people felt that it was not fair. Hence depression and psychological stress have taken their toll on the economy and on Russian society as a whole: 60 percent of Russians don't make enough money to meet their economic potential. If the government is serious about increasing people's well-being, making our economy more efficient and solving the demographic crisis, it will have to address the problem of inequality in the near future.